This last weekend, my daughter was in a school performance of “The Little Mermaid”. There were so many talents displayed – song, dance, prop prep, costumes, sound management, makeup, acting – just to name a few. And these kids had worked hard. They had been practicing for weeks and weeks to prepare for these few nights in April. They had long rehersals, extra time at home and an occasional Saturday meeting. There were lines to memorize. Dances to learn. Props to prepare. Costumes to fit to people. Seriously…hard work. They presented this hard work beautifully. These young people are incredibly talented. They are hard working and dedicated to the task at hand. I have seen this over and over again in the last 3 years that my daughter has participated in the spring play. There may have been a year that they weren’t too excited to present the play, but they still gave it their all and didn’t quit until the curtain went down on the last night. They were all using their gifts. When we think of gifts, we think of big things like presenting God’s Word or teaching or being a missionary or singing in services. But our gifts can come in many shapes and sizes. Some are obvious while others are inconspicuous. But regardless of the attention they receive (or don’t receive), they are important. And we must use them – daily. For example – I am a planner and an organizer. I like to know what is coming, when it will get here and how I will handle it. I plan out lunch and dinner every day. I have the menu listed in my kitchen for everyone to see. I do this to serve my family and to provide a sense of stability to our day – things may be crazy today but at least I know what is for dinner. Crazy, I know, but this is how my brain works. Not everyone can plan things. For me, this is a gift. You see, I think that we overlook little details like planning and chalk them up to just being able to do things like that. But I choose to see it as a gift that I can give my family. Occasionally, I will let that gift seep over into other areas of my life. I have been known to plan events at church. I create treatment plans for my patients all the time. I help plan vacations for the family. I organize the house on (what seems like) a daily basis. But in all these instances, I am serving someone. That’s the part I think we miss – the reason behind what we are doing. Yes, I do it to make my life feel easier but the main purpose is serving. And in serving, I am helping the people around me. I am showing them Christ in my life. I don’t know what gift(s) God has given you. I don’t know if they are flashy or private, obvious or inconspicuous but I do know that your gift(s) are important and God means for you to use them to bring Him honor and glory. I know that He is disappointed when you don’t use them. I know that He gave them to you for a reason. And I do know that you and I both need to get out there and use them more and more. You never know when His gift He has bestowed upon you might lead someone to the greatest Gift anyone could receive – salvation through Jesus Christ. It has been a while, yes, I know. Things have been a bit crazy at my house. I’m trying to get accustomed to reading through the Bible in a year. Some days have really long chapters that don’t leave me much time to write. I’ll get it figured out though. Just might take a while. Let me tell you about some challenges that my family has faced in our walk lately. Saturday, my daughter had a cheer competition. The team did very, very well – they weren’t perfect or spot on, but very good. Their routine had a high level of difficulty and they executed it fairly well. They received 3rd place with this presentation. Now, that is good, right? Third out of 5 is not too bad. The problem is that the team that won had a much less difficult routine than our girls. And the team that got second didn’t even have a cheer in their routine for a cheerleading competition. Now, walking “worthy of God” in this situation was tough. My daughter felt cheated. She felt betrayed by the judges who were seemingly not looking for the team to challenge themselves. She cried a lot. And at the end of the night, my husband and I declared them champions regardless of what the judges said. But she still kept crying. Then comes the talk. “It’s okay to be sad. You have tonight to be sad. But when tomorrow comes and you wake up, the time has come to move on. You can’t dwell on this and let the devil has his heyday.” And you know what? The next morning my daughter woke up puffy eyed and ready to face the day with a whole new attitude. I am stilll trying to walk “worthy of God” in this situation. It is hard to watch your children go through this kind of thing and lead them in the path of righteousness. Yesterday, we sent my son off on his first missions trip – to Haiti. Now, I am super excited for him. I am not worried about him at all. I am so very excited to see what God is going to do in his life. This challenge in our walk comes from not being with him on this journey. We can’t really communicate with him, except via his friend with an international plan. But I don’t need to talk to him everyday to know that God loves and cares for him more than I ever could. I know that God sees him. God knows my heart. He hears my prayers on his behalf. So, as you can see, things have been a bit hairy around my house – I’m sure that it is the same way around yours. But that doesn’t give us an excuse to do anything other than “walk worthy”. It is a call to do so through the tough times in life as well as through the less challenging times of life. It is a call to live with God. It is a call to walk with God. Today, as you face your Wednesday and all the fun it holds, “walk worthy” and walk with God. It makes the journey to Heaven that much sweeter. It is the week of Thanksgiving. I agree with the statement that we should be thankful more often than once a year. I try very hard to live a life of thankfulness. 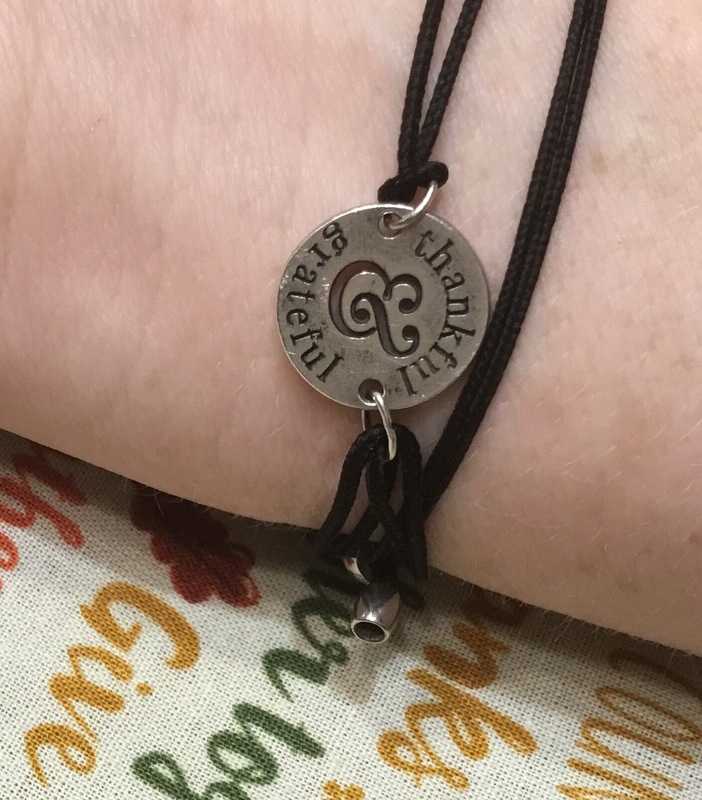 As you can see here, I wear a bracelet to remind me to be grateful and thankful. I think that being thankful can take many forms. Prayer – Reaching out to God in prayer just to tell Him how appreciative you are for Him being active in your life. Songs – Singing praises to God with a heart in a position of humbleness and gratitude. Conversation – Have you ever taken the opportunity to turn the spotlight off yourself and turn it on God? Giving Him the glory for an achievement in your life is a great way to show thankfulness. All too often, we are so focused on ourself that we take away the opportunity to praise Him and give Him glory. Giving – I think that when we take the time to give to someone else out of the abundance that we have, we are, in a way, giving thanks. When we give with the heart of humbleness and the desire to help someone else along, we are telling God thank you for supplying my needs and giving me the opportunity to help someone else. Just like anything else, all of these acts of thankfulness can be corrupted by our heart-itude. If our heart is focused on ourself, if our motive is promoting self, then each act is torn to pieces in front of the throne of Christ. Our acts of thankfulness becomes acts of pride and selfishness, neither of which is honoring or glorifying to God. So, as you enter this week of busyness – planning, traveling, buying, cooking, cleaning, preparing and all the other craziness that I know goes on at my house – check your heart. Make sure that you determine in your spirit that you will choose to plan, travel, buy, cook, clean and prepare with thankfulness in your heart because all of these actions require prayer, singing (to keep from going crazy), talking with others and giving of yourself and what you have out of your abundance. Thanksgiving is a time for giving thanks. Make sure THAT is your primary priority. We have been a shoebox packing church these last few weeks. It all started when we had a youth rally and invited other churches in the area to bring items that we could collectively use to pack shoeboxes for children in foreign countries (or possibly our own country). It is called Operation Christmas Child. It was a great time and a huge blessing. We were able to pack 100 shoeboxes on that day. 100! That’s a lot for a group of little congregations! However, the cost for shipping each box is $9. That’s $900! How in the world could we possibly gather that much money?! We shouldn’t have even let that thought cross our mind. We asked the people to give and did they ever! We were able to gather enough money to ship those boxes, plus some! My son is going on a mission trip to Haiti in January. His school is collecting a little bit different type of shoebox for that trip. We took our youth group (and young adults 😉 yesterday and filled shoeboxes for this cause as well. We invaded the local Dollar Tree after a pizza lunch and packed until our boxes overflowed. It was so much fun! And the super thing about it is that my son may have the opportunity to hand out some of the very boxes that we packed. Some little child will be able to play and appreciate what we chose to pack into that plain brown box. Those boxes cost $7 to ship. And you know what, that is covered already – before we even packed the boxes. My point is this – God is ready to supply all we need and more each and every time we choose to serve Him with our words, thoughts and actions. All He is asking us to do is go. Go and do. Go and try. Just Go! We don’t need to worry about the why or the how. We just need to listen for the what that He wants us to do. It is my goal to only go to the grocery store one time a week. That rarely happens. Despite my diligence in making out a grocery list, checking to see who needs what and then following that list to the “t”, I usually end up back at the grocery store for something during the week. Right now, my fridge is empty and my teenage son is starting to panic. The apple juice is gone. The milk is gone. Life might just end if the child doesn’t have apple juice and milk! But going back the the grocery store isn’t such a bad thing – it means that I sufficient funds available to supply the needs of my family in a spontaneous moment. It means that all the good stuff that I have purchased has been gobbled up by 2 growing teenagers. Good stuff in, good stuff out. So, I know you have to be wondering what in the world going to the grocery store has to do with going to church. Hold on and see how my crazy brain works. The assembling of ourselves together was not meant to be a one time a week event. We need the support and love and encouragement of one another often. When I don’t see my church family more than one time a week, I feel left out and sad and empty inside. I love vacations, but I miss being with my brothers and sisters at church. I need to share life with them. I need to hear their encouraging words. I need to laugh with them. I need to cry with them. I need to serve with them. I can’t do that one time a week. This life is challenging. We all face hurdles that have to be jumped. We all face knots that need to be untied. We all face obstacles that have to be figured out. How can we do all that alone? We can’t. We need help. We need words of encouragement and guidance. What better place to find all that than among people who love the Lord. Wrapping all this up, if I can’t make it through the week with only one trip to the grocery store, how do I think that I can make it through the week with only one interaction with my church family? God used the writer of Hebrews to encourage us to go and be with our church family frequently. He doesn’t want us to feel alone. He doesn’t want us to feel weak and neglected. He wants us around people who love Him so that we can grow and help one another out. Things that the grocery store have to offer us are life sustaining and needful. The things that our church family and serving God have to offer us are life sustaining and needful. So, get out there. Get involved in your church. See what you have really been missing by staying home when the church doors are open. Yesterday, our youth group completed our annual pizza date and collection of items for Operation Christmas Child shoeboxes. We had several teenagers join us on this excursion. And man, did they ever have fun! I loved looking down the table at lunch and seeing all those glasses of soda hovering around plates of pizza. I enjoyed listening to them laugh and poke each other. I was grateful for their kindness and respect to those around them. And then when we got to the store to collect our items, I was touched by their heart in gathering so many different items for their individual shoebox. They were concerned about this child’s hygiene, eating utensils, toys/entertainment items and other things that they could use around their home. And after the needs of the shoebox were met, that is when the laughing started. I could hear my son and several other boys just giggling and having a grand ole time. I went to search them out and what did I find? They had found the masks and was trying several on. It didn’t matter that the masks were too small. It didn’t matter that they were being stared at. All that mattered is that they were having a great time. Then they went to the church house. After practicing for a puppet show and working on some music, they began playing spoons. It’s a card game that can get very intense, but they love it. It is a tradition for them. They laughed. They yelled. They were reaching over one another and knocking down chairs. They were having a great time. It was spectacular! I tell you all of this to remind you of this – friends are important. Godly friends are even more important. It is needful for you to have fun with your friends. It is needful for you to serve with your friends. God has given us the opportunity for friendship and He wants us to enjoy it. Schedules are busy and life gets hectic, I know. I am right there with you. I wish I had more time for friends. I miss girls night out. It seems like I am so caught up with all the activities my kids are involved in that I forget to make time for my friends. So this week, let’s do something about it. Even if it is just sending a text or an email, reach out to a friend. Let them know that you are thinking of them. Let them know you are praying for them. My daughter has a good friend that accepted Jesus as her Savior this school year. Since that time, she and my daughter have been reading and discussing the Bible together. It’s really cute, if one forgets to read a chapter, they have to give the other one a dollar. If they neglect to read more than one chapter, they have to buy a spirit ribbon on Friday and the other one gets to decide where they wear it, like on their forehead. Not something I would do, but it is the way they hold one another accountable. Last night, they were face timing and discussing what they had read the night before. My daughter’s friend had made a list of questions to talk to her about. She is a new Believer who is hungry and thirsty for the Word. She has been taught so many different things from so many different people that she just wants to know what Jesus says about everything. And what better place to find it than the Bible. When was the last time you and some close friend of yours had that sort of discussion? When was the last time you were hungry for the Word of God? When was the last time you made a list of questions to discuss with someone about what you read in the Bible? The older we get, the less likely we are to ask questions. We don’t want to look foolish. But this young lady doesn’t care what she looks like to others. She wants to know God more and more. And her questions are thought provoking. They make you stop and consider what was going on, who Jesus was talking to and why. It’s a great way to learn. I also think that we ebb and flow when it comes to reading God’s word. We have times when we are really diligent about it and other times when “stuff” gets in the way. Maybe we all need some sort of accountability partner to keep us reading. I think it would be good for us. Maybe it would get us to sincerely desire the Word of God in a whole new way. So this week, I want to challenge you to read His Word diligently. Let His words so seep into you that you are contemplating long after you close the Book. And ask questions. Teachers always tell their students at the beginning of the year that there is no such thing as a stupid question. And it is so true. More than likely, someone else is thinking the same thing. Go, learn and grow.